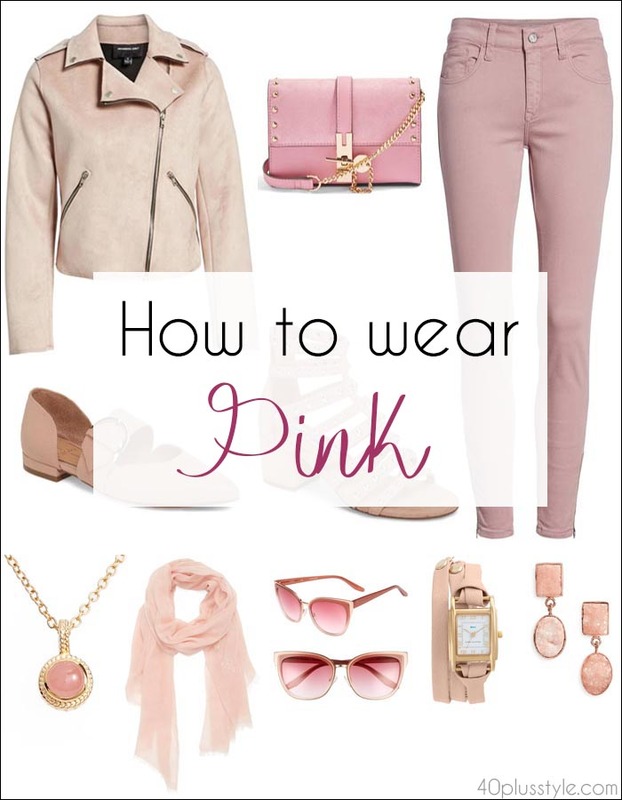 40+ Style » How to wear color » How to wear pink – a comprehensive guide with lots of ideas and color combinations! Rose quartz was selected as one of two (yes, Pantone selected two) colors of the year for 2016. And, it’s still one of Pantone’s favorite shades for 2018. This time, the color experts suggest either a mellow rose shade, or a bright and bold pink for fall 2018. With rose quartz or mellow rose, the style opportunities are endless. 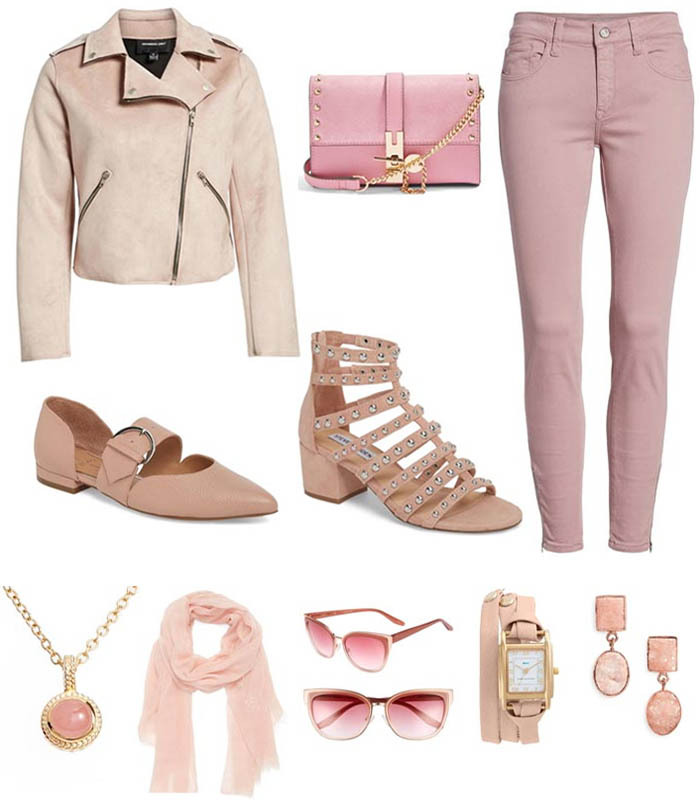 Let’s show you how to wear pink and create fabulous outfits with this color! Pink can be universally flattering. Especially a rose hue, which does not wash out lighter skin tones or contrast too harshly on darker skin tones. It actually warms, which is an exciting characteristic to play with. Often times, especially as we get older, we tend to shy away from wearing pink. We either refuse to come across as if we’re playing princess or just feel that the look is too frilly. But, wearing pink can be a successfully chic route to take. The key is to treat it like a warmer neutral with endless color, texture, and print combinations. Here are our tips to guide you as you dive into the color which has been bang on trend for the last few seasons, and continues to be popular. Texture always gives pink a little edge and adds visual interest that immediately makes a look more chic and multi-dimensional. The cardigan, in particular, could be worn with whites and neutrals for summer, and then taken through to winter by wearing over darker hues. Prints and contrasts are effortless ways to add more complex tones to your look without having to add too much more to your ensemble. 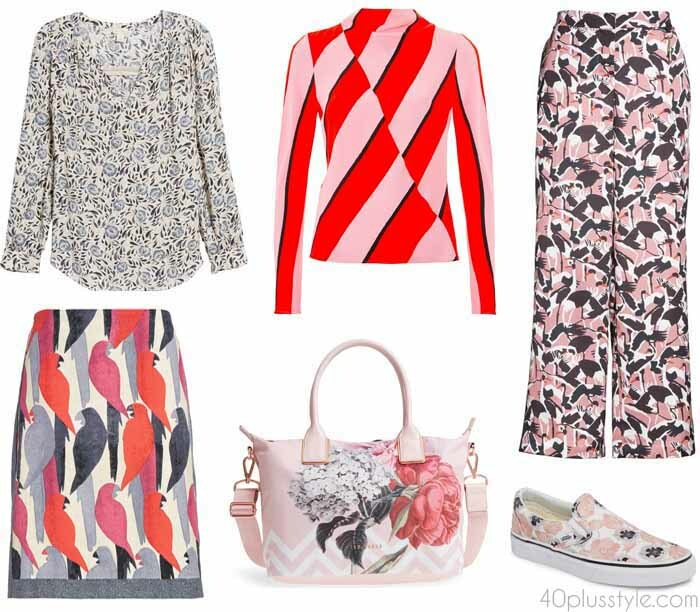 I particularly love the silk pants and bird-print skirt! A very interesting and chic visual juxtaposition is to select pieces with menswear-inspired cuts and silhouettes. This allows you to downplay the softness of the pink, and still allows you to wear larger pink pieces. You can also use pink as an accent for a look. From single pink accessories (like sunglasses) to its use as a subtle color, adding touches of pink is the perfect way to add a feminine highlight to your look. Mixing hardware and such a romantic pink also creates visual interest. The look comes across as romantic with a little edge. It is also a fun way to incorporate a bit of a rocker tone into your look. Look for pieces with studs and buckles, or opt for a biker jacket in pale pink. 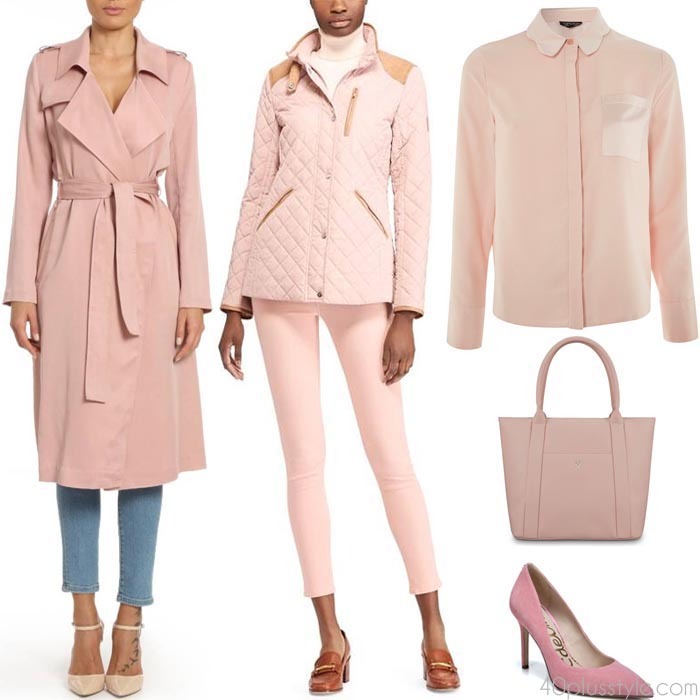 Another way to reduce the “princessy” element of pink is to opt for a very chic, classic style, such as choosing a trench coat in pink, rather than the traditional beige. Of course, not all pink has to be soft, such as the dusky or mellow roses suggested by Pantone. This year, the world’s authority on color couldn’t decide between a soft pink and a bright pink, so it simply included both in its shades for 2018. If you opt for bright pink, you can let one bold, pink piece do the talking and keep the rest of your outfit low-key. We were very interested to see the color combinations that others are creating for rose quartz. So, we went over to colourlovers and found the following palettes that caught our eye. With spring options in the air, one of our favorite colourlover palettes is still the Pantone Spring 2016. It is an unabashed combination of rose quartz with bright and warm yellow, demure and bold blues, and summer coral. Plus, it’s still bang-up-to-date as it not only combines pink, but also incorporates another key color for 2018, yellow. Another combination I really like is to combine pink with gray. Here is a collage I created for my article on how to wear gray! How do you wear pink and what’s your favorite pink color combination? I love pink but have been shying away from it as I’ve been getting older. But your outfits clearly show that it can look great! All your outfits look amazing, and I like especially the white jeans with the pink sweater! So chic! I did recently buy a purse in rose, and I love it. Now I’m inspired to try some clothing and/or more accessories. I’ll also play a bit with the Pantone Spring 2016 color pallette. I like your outfit possibilities based on it. Thanks Andrea. 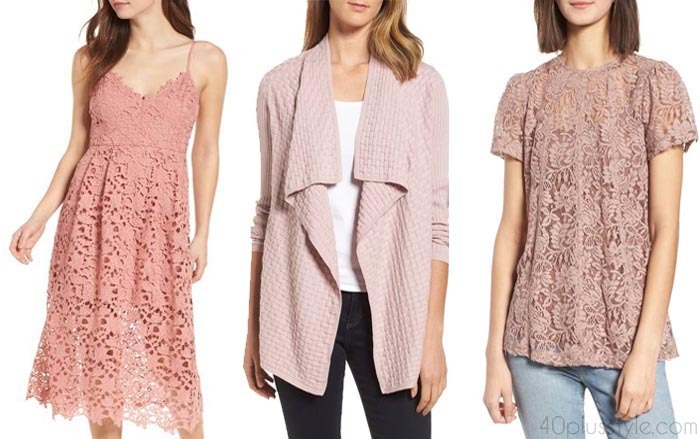 Yes, pink has become quite a versatile and popular color in my wardrobe! I can’t wait to get a bright pink bag to style with burgundy and blue. 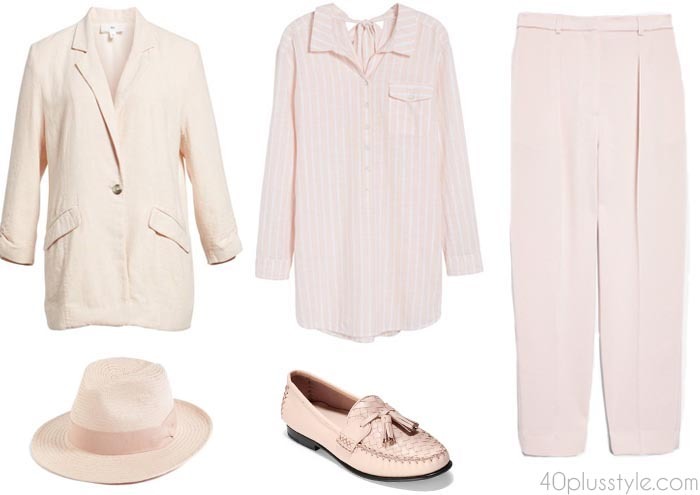 And with pink in the air, I would love to try a pink blouse with trousers and heels for spring. Thanks for sharing these styling looks. Hi Sylvia, your combination are great! Would you like to see my pink combination? Wow that is amazing Rita. What a fabulous coat and necklace! Will need to update these…. you wear pink in a very cool and chic way! fantastic! You’re welcome. I think pink with bright yellow can be very chic! fabulous suggestions. I really like #2 “go for contrast and prints”. Some colors in large doses are not flattering but they usually can be worn as part of a pattern, especially florals. I agree, but a little pop of bright color can look really nice! I have traditionally steered away from pastels in general but Rose Quartz pink really flatters my skin. I already own an Ann Taylor sweater in this shade and I will consider shopping for a top, scarf or other accessories to pair with the clothes I own. Thank you for the color palettes and outfit examples, Sylvia. Lots of inspiration to work with! I love it when you add colour combination bars… I will have to come back to this post and read it more carefully. So little time at the moment. So I love some of the looks you posted. Where do I buy them? All items that are still available online are listed in the shoppable boutique above. Sylvia, you are absolutely brilliant with your color combinations, and your individual styles. I look forward to seeing your unique, and beautiful outfits!!! Top is from In Good Company https://ingoodcompany.asia/ Skirt is old and from a small boutique. Shoes also a few years old and don’t know the brand (don’t have them here currently).